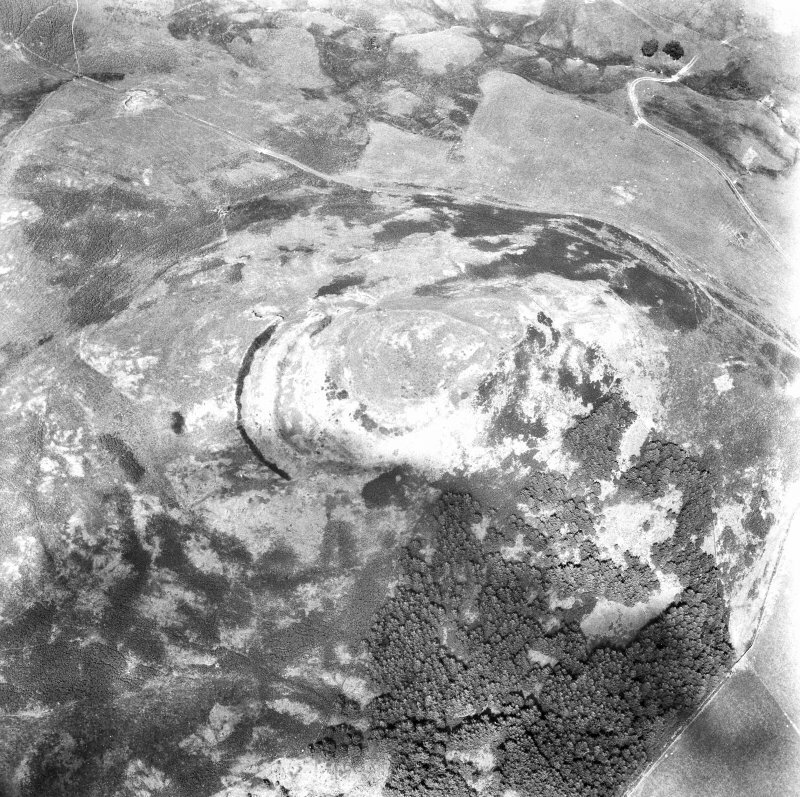 Oblique aerial view centred on the remains of the hillfort, taken from the NW. For (approximately provenanced) bronze objects tentatively suggested (by Laing) as coming from Tynron Doon, see NY18SW 106. This site, on the summit of Tynron Doon, is basically a multivallate Iron Age fort with an Early Medieval (Dark Age) and Medieval occupation. The final phases include a (?) 16th century tower-house and an 18th-19th century shepherd's bothy. The Iron Age structures must follow much the same basic plan as the present modified structure ie a central plot defended on the N,E and S by steep natural slopes. The W and NW approaches were defended by two main ramparts and three ditches; several of the ditches are rock-cut. 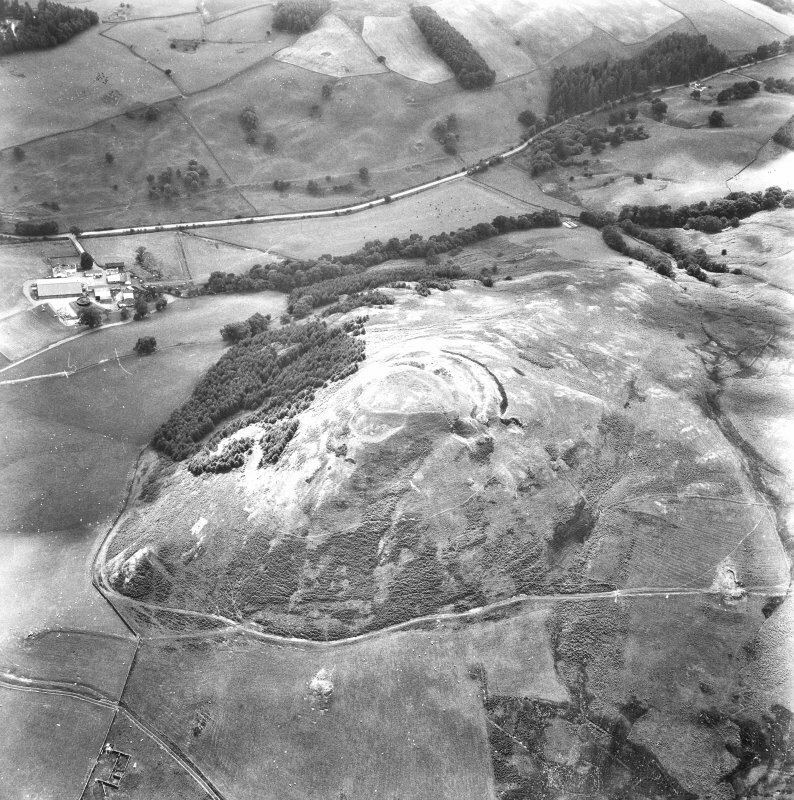 Below the summit on the NE slopes there are prominent remains of a terrace cut into the slope; the terrace is defended by a small rampart but its use is unknown. No details of the Dark Age occupation are available but presumably the Iron Age fort was merely utilised with few or no major changes. The occupation waste from this period lies below the large nettle patch on the SW slopes. There is no positive evidence regarding structure changes on the site during the medieval period. 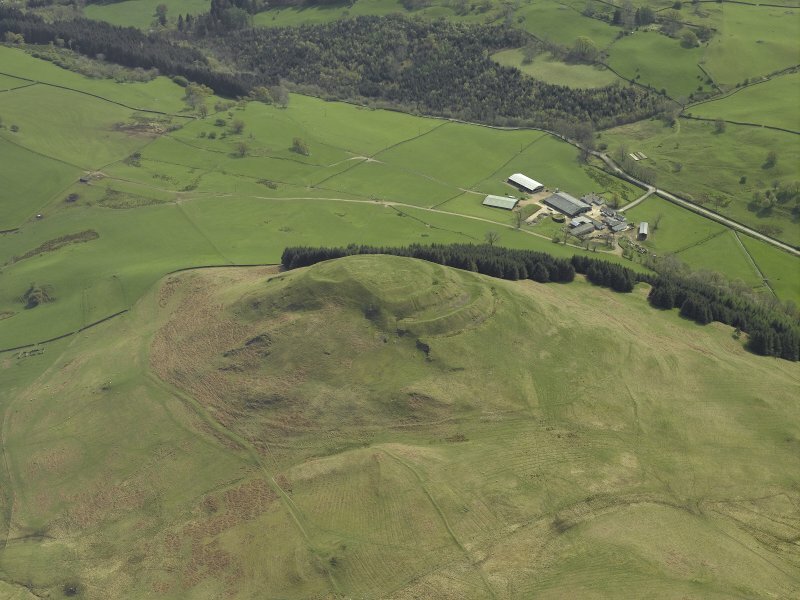 It has been suggested that the hill-top might have been modified as a motte and the ditches re-cut some time around the late 12th or early 13th century in order to correspond with general practice elsewhere in the area. The late medieval period is represented by the base plan of an L-shaped tower-house of (?) 16th century date, at the NW corner of the central plot. The remaining wall plan measures approximately 20 x 42 ft with an extension at the NW corner, 8 x 10 ft, which very probably represents the wheel-stair of the tower. The structure was demolished some time around 1700-50. 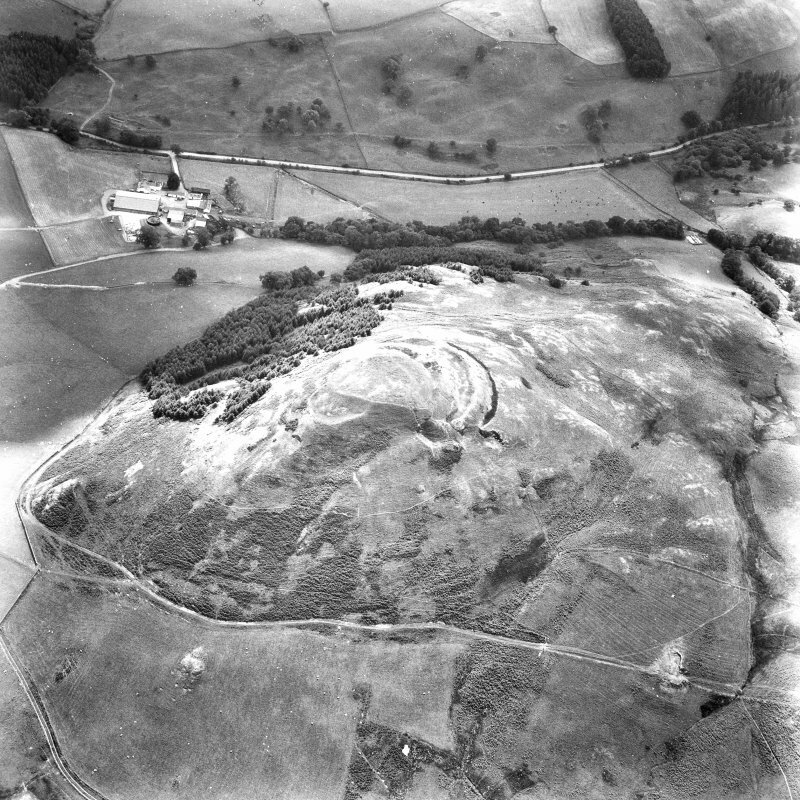 There are indications that the hill-top at this period was enclosed within a barmkin wall with a gateway at the SW corner of the tower. Occupation during the 18th-19th century appears to be represented by a hut circle in the SE corner of the plot; this is very probably the remains of the shepherd's bothy built when the tower was removed to build Tynron Kirk. Artifacts found either in 1924, or when sections were cut in 1964-7, are in Dumfries Museum. They include fragments of a bracteate pendant, dating to the late 7th-8th century; blue glass beads, fragments of bloomery waste, and vitrification. (Finds are fully listed and described by J Williams 1971). 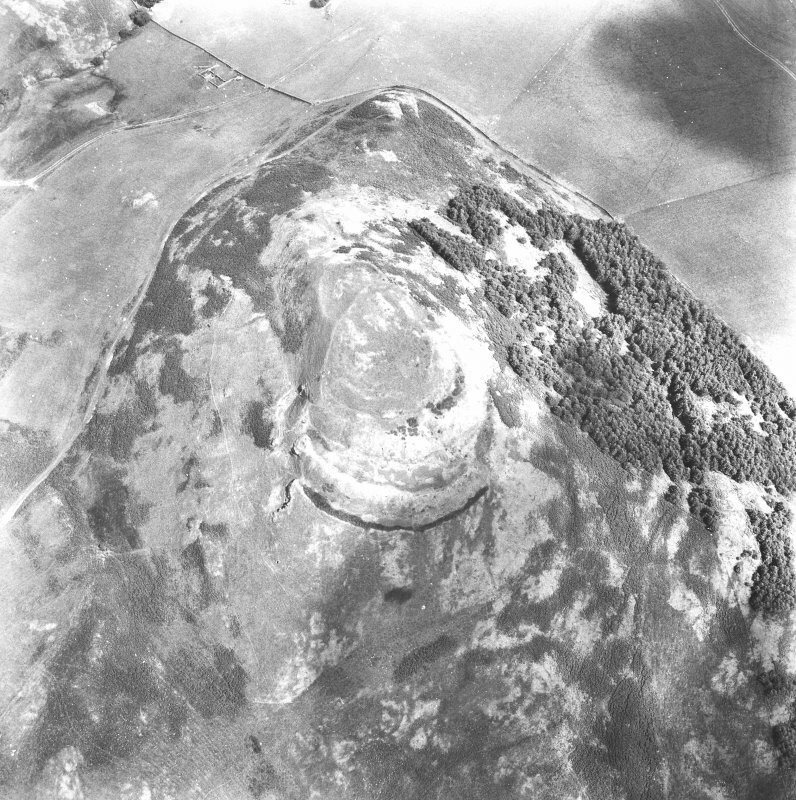 A multivallate promontory fort with a strategic 'platform' annexe cut into the steep natural slopes on the NE side. 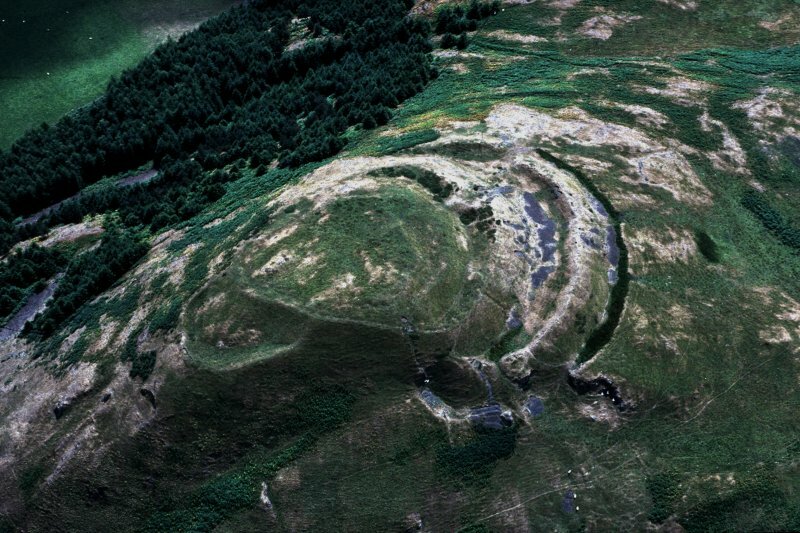 The triple turf-covered shale ramparts on the W side, up to 6.5m high, are broken by a staggered entrance in the SW which leads to an undulating plateau top overall 60.0m E-W by 55.0m N-S. There is no suggestion that the ramparts, ditches or terraces have been later recut or modified, although the top has low linear banks roughly following its perimeter which are feasibly connected with the early or late Md occupation. There is no surface trace of the tower-house at the position indicated, but the perimeter banks are consistent in scale with a barmkin arrangement. At the SW corner of the top, near the entrance way, is a stony circular bank, 1.5m wide, of a former structure measuring overall 8.5 diameter and 0.3m high. It is contiguous with the perimeter banks and does not have the form of a hut circle. 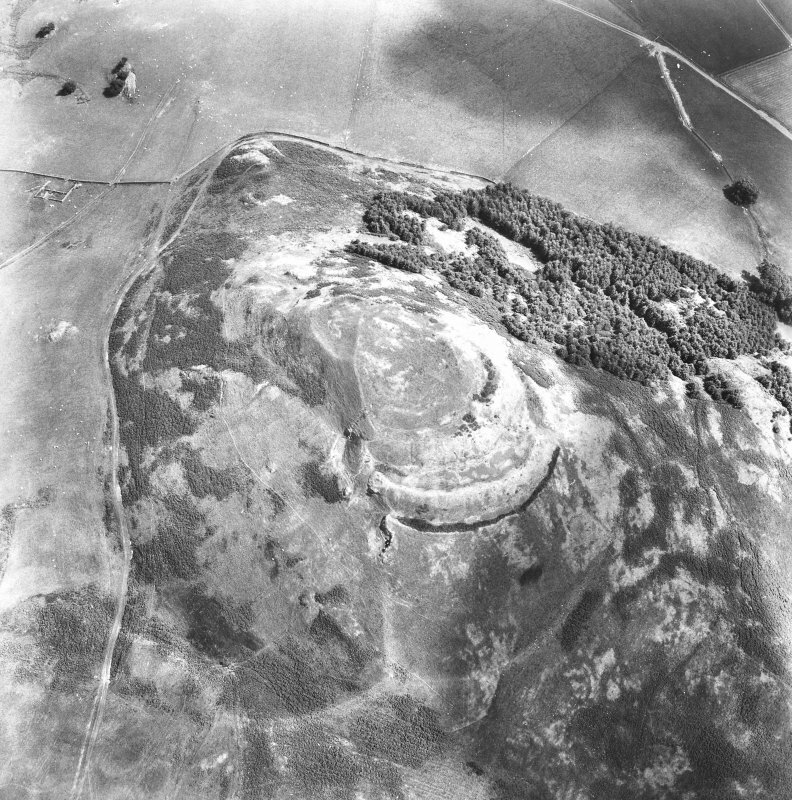 This fort is visible on vertical air photographs, (OS 73/396/276-7, flown 1973). 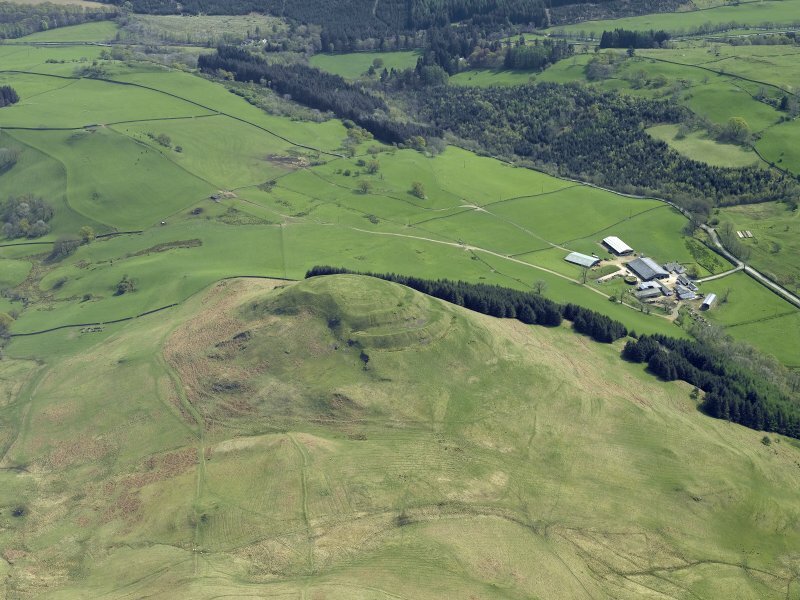 Occupying the conspicuous summit of the steep eastern spur of Auchengibbert Hill, this massively built fort commands extensive views over the country to the S and E. The main lines of defence lie on the SW quarter, blocking the easiest line of approach across the saddle with Auchengibbert Hill, and comprising at least three ramparts with internal quarry ditches. The ramparts are particularly massive in comparison to other forts in the Galloway, standing up to 6.5m in external height, and together with the rock-cut ditches from 7m to 15m in breadth between them, create a formidable belt of defences up to 60m deep on this side. The terminals of all the ramparts turn inwards to either side of the entrance on the SW, to form an entrance way some 50m in length, though rather than an inturned entrance as such, the innermost pair are more likely to be the returns around the terminal of the innermost ditch to meet an inner rampart obscured by the construction of what is probably a medieval or post-medieval castle within the interior. On the N the outer defences rest on the lip of the steep slope forming this flank of the hill, while on the S they peter out on the slope beyond the entrance, but on the NE what may be the innermost rampart extends round the margin of the summit, and an outer rampart loops out to take in a lower terrace. The course of the probable inner rampart and the original extent of the interior are difficult to determine, but an area measuring about 50m from NE to SW by 40m transversely (0.17ha) was probably enclosed on the summit. The character of the later castle is not altogether clear, but a ruinous wall on which in 1912 Alexander Curle observed traces of lime mortar (RCAHMS 1920, 207-8, no.609) forms an oval enclosure measuring internally 45m from NE to SW by 39m transversely; adjacent to the entrance it incorporates a circular structure 8.5m in internal diameter. Two trial pits sunk in the 1967 within the fort, one in the terminal of the middle ditch adjacent to the entrance, and the other immediately outside the wall of the castle on the SW, produced several pieces of vitrifaction, along with evidence of the medieval occupation. Midden material believed to have derived from the occupation of the interior was also recovered in 1964 and 1967 by excavation in the scree below the defences on the S; some of this material probably relates to the use of the site as a castle, but it also included glass beads of early medieval date (Williams 1971). Williams believed that the late 8th-century fragments of gilded copper-alloy sheets bearing vine-scroll and figurative decoration, which were found in 1924 in Tynron (De Paor 1963; Webster and Backhouse 1991, 173-5, no.135), came from these screes, though there is no evidence this was the case.